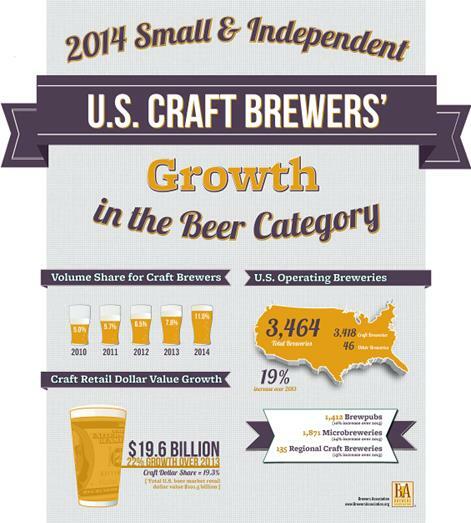 The Brewers Association has released the 2014 data on craft brewing growth and for the first-time ever, craft brewers reached double-digit (11%) volume share of the marketplace. In 2014, craft brewers produced 22.2 million barrels, and saw an 18 percent rise in volume and a 22 percent increase in retail dollar value. Additionally, the number of operating breweries in the U.S. in 2014 grew 19 percent, totaling 3,464 breweries, with 3,418 considered craft broken down as follows: 1,871 microbreweries, 1,412 brewpubs and 135 regional craft breweries. Throughout the year, there were 615 new brewery openings and only 46 closings. Note: Numbers are preliminary and the Brewers Association will release the list of Top 50 craft brewing companies and overall brewing companies by volume sales on March 31. Additionally, a more extensive analysis will be released during the Craft Brewers Conference & BrewExpo America® in Portland, Oregon from April 14-17.